The Importance of Playing with Puppets - Guest Post from While She Naps. I love puppets! Kids love puppets! They provide such a great way to engage kids; capturing both their attention and their imagination. Even when kids eventually realize there is a person behind (or under or holding) a puppet, the intrigue and affection is still there. Today I'm introducing guest blogger Abby Glassenberg, puppet designer extraordinaire, and blogger from While She Naps! Can you see from the title how awesome her puppets are?! Abby has some great ideas (and therapeutic reasons) for using puppets in play and for therapy sessions. She also has some awesome ideas for making your own puppets! I'm looking forward to trying out her pattern to make my own. I would love to see your puppet if you make one! Thank you Abby for contributing today! Puppets can play a special role in a therapy session, a classroom, or at home with your family. When we slide our hand inside a puppet and begin to make it talk we can suddenly be anyone we want. Through a puppet we can express thoughts that would be too difficult to say out loud otherwise. A puppet can be angry, or sad, or frustrated about a situation and express those emotions fully without worrying about the consequences. When we play with puppets we give ourselves permission to talk about complicated situations and to be silly too. If you don't already have puppets in your toy box of toolbox it's worth buying a few at a toy store or making your own. As a teacher and mother of three girls, one of whom has special needs, I love having puppets available in my arsenal. I also like to make toys for my children to use. As a sewing designer, I realized that there was a need for an open-mouthed, expressive puppet that was easy for moms and therapists to sew themselves. This realization led me to create the Chit Chat Puppet Pattern for people just like me who want to create a special puppet to use with the children in their lives. It's a simple-to-sew pattern that allows you to easily make custom puppets that fit your particular needs. The wonderful thing about puppets is that they are a representation of a living being so puppets can get away with things that people can't. Puppets allow us to experience a fantasy and that's such a valuable thing for a child. One approach to playing with puppets is to use a visually neutral puppet that's neither a boy nor a girl and doesn't have many identifying characteristics. This means that the puppet doesn't resemble anyone and can be anyone. A child can project whatever they want onto the puppet, rather than feeling constrained by the puppet's features. Another approach is to buy or create a variety of puppet characters, including a predator puppet and a friendly puppet. Distinct characters allow you and the child to act out scenarios together, and you can even switch roles to try out different resolutions to the stories you're acting out together. One way to begin puppet play is to by presenting a puppet that has a problem that's an exaggerated version of one the child is actually facing. For example, of the child is struggling with accepting a new baby into the family, the puppet can wish that the new baby would disappear and it could be the only child once again. In this scenario the puppet is just like the child, only more so. This experience give the child an opportunity to unburden themselves of thoughts they were previously afraid to openly express such as wishing a baby would disappear. You can also present a situation similar to the one that the child needs help resolving and use the puppet to model new behavior patterns and rehears coping strategies. Possible situations that are suited for this kind of play would be winning and losing at games, turn taking, greeting people and active listening. To encourage the child to problem solve and to create a bond with the puppet, suggest that they be the puppet's helper. Can the child help the puppet accept that it's lost at a board game? or teach the puppet to greet a friend appropriately? Of course playing with puppets doesn't always have to have a serious aim. Putting on a silly show with a puppet is a fun way to spend time together enjoying an open ended, creative activity. It's definitely okay to just have fun with your puppet! There are lots of puppets that are simple to make together with children. Try a paper bag puppet, a clothespin puppet or a sock puppet to get started. And of course, there are many commercially available puppets you can buy at the store. if you'd like to create a unique puppet to use with your child or with your students. however. I encourage you to try my Chit Chat Puppet pattern. It's intended for people with all levels of sewing experience and will allow you to create an array of unique, high quality puppets you can use for years to come. Abby Glassenberg is a sewing pattern designer, craft book author, teacher, and writer. On her blog, WhileSheNaps.com, she writes about the sewing industry, running a creative business, and the online culture of craft. She is the co-founder of Craft Industry Alliance. Abby has an undergraduate degree in history from Johns Hopkins and a master’s degree in education from Harvard. She taught middle school social studies in Mississippi through Teach For America, and 6th grade in the Newton Public Schools before becoming a textile artist. She’s the author of three sewing books. Abby lives in Wellesley, Massachusetts with her husband and three daughters. A great debate in our schools and our society. Some believe strongly in the need to develop habits for studying and working at home. Some believe strongly that school is for academic learning and home is for "being a kid". Some schools have introduced an "opt in/opt out" option. What is your opinion about homework? As an occupational therapist, I understand the need to practice skills. When I see a child once a week for a short period of time, I know that my effectiveness is in the carryover of what we are working on together .... in their every day lives. A frustration is when parents rely on me to "fix" their kids (although they might not use that word). Ideally, I see myself as a coach who may provide an insight into why a child is doing something the way they are, offer some tips and tricks to help with the problem, help show the child and others ways to improve (compensate or modify activities) but then rely on the rest of the team (parents, teachers and child) to practice or also come up with new ways to help address the same goals. On the other hand, I also understand the frustration of parents who find "homework" challenging to complete. Life is busy and kids with special needs seem to have a lot of extra work that needs to be done (in addition to regular school work). This year, I've introduced my version of an opt in/opt out homework grid for my occupational therapy kids. The grid outlines five common areas most of my OT school age kids are working towards achieving. These are core muscle strength, bilateral coordination, hand strength, pincer grasp and letter formation. The examples of homework should be easy for families to incorporate into their daily lives and require little to no set up or extra equipment. I include an introductory letter to parents explaining the grid and the target areas. I recently shared this homework grid with my IG followers. I ran a poll asking if I should share my OT homework grid here! The result was a resounding "YES" that people wanted to get a copy of this homework grid! Thanks for everyone who participated in the poll. So true to my word, here it is! I've taken off my signature from the "parent letter" so that you can add your name to it but I ask that you keep my "Your Kids OT" name on it before making copies. Subscribe to the Your Kids OT Newsletter! Receive your FREE PRINTABLE as a thank you! This form collects information we will use to send you our newsletter with our latest posts, products and special offers. Already subscribed? Don’t worry you won’t be added twice! Success! 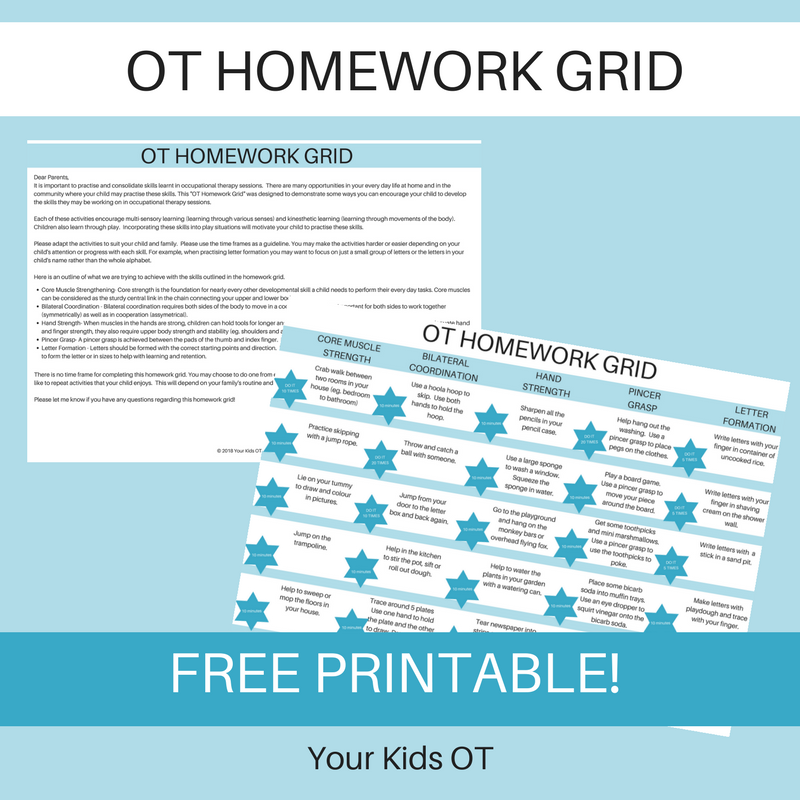 Now check your email to confirm your subscription to receive the FREE "OT HOMEWORK GRID" Printable! If you do use this homework grid, I would love to hear your feedback! Why not give me that feedback/review on the Your Kids OT Facebook page?! I always love to hear from my readers!